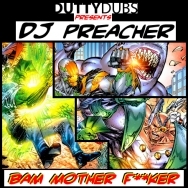 Ryan Mullins a.k.a DJ Preacher found his roots in a town just north of London , Hemel Hempstead. As a 23 year old Producer / Mc he has spent years fine tuning his skills on the stage and off. He has also been involved with bringing big name artists down to small town gigs , events and even house party’s for the right price. He started Mc-ing to garage at the age of 12 and was playing gigs for a local record shop at 13. He progressed on to drum and bass were his mc-ing took off. A few years later he got in to Producing and started on the long road of music production and fine tuned music knowledge during college He joined up with a live drum and bass band and played some local headlining gigs and got multiple newpaper features locally. The band split when everyone went off to university. Witch is when he really started working on his production techniques. He has a back catalogue of release worthy drum and bass, house and hip hop tracks. But his focus is now on dutstep and he is starting to make headway.